Lambe Creek House is an atmospheric secluded house built close to the short tidal creek of the same name. Its low ceilings and rambling room layout is reminiscent of a Jacobean manor-house, but in fact it was only built around 150 years ago. Thus the current owners describe it as 'Cornish Victorian'. Malpas is visible from the house, and so too the spires of Truro Cathedral. There is a small jetty from which it is possible to row over to 'The Heron', a pub well-known to locals. And, more than 50 years ago, this is exactly what Man Ray, the photographer and surrealist, did. 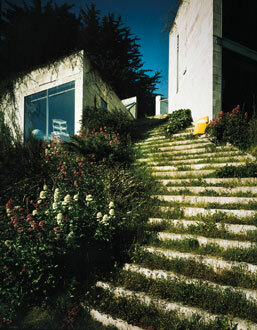 The house was owned by the brother of Roland Penrose, artist and founder of the ICA. In 1937, shortly after the surrealist exhibition in London, artists and writers known to Penrose gathered there for a summer holiday. This included: Lee Miller (pictured above leaning out of an upstairs window), Man Ray, Max Ernst, Leonora Carrington and Paul Eluard. Anthony Penrose, who manages his fathers estate, has a fascinating archive of images recording this celebrity gathering which appears to have involved a lot of bed-hopping and wife-swapping, all in the name of artistic and intellectual freedom. Prints of some of these images are available for purchase from www.rolandpenrose.co.uk, and Falmouth Art Gallery still have catalogues of an exhibition held there in 2004. The work of Ben Nicholson and John Wells is well known to fans of St Ives modernism, but the link between their work and that of the architects, Richard Rogers and Norman Foster is not. The year that Nicholson famously 'discovered' Alfred Wallis in St Ives was also the year he met Wells. Wells had cousins, the Williams family, who lived in Feock and the London art collector and advertising executive, Marcus Brumwell had a holiday house there. Nicholson and Christopher Wood met John Wells whilst staying with the Brumwells. There are several drawings and paintings dating from this time, the best known being Nicholson's 'Pill Creek by moonlight'. 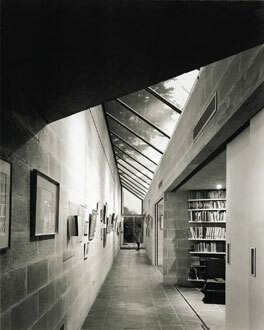 Many years later Brumwell gave the young Richard Rogers, who was his son-in-law, his first serious commission. 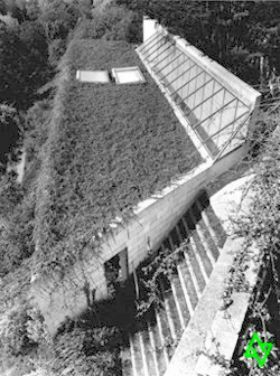 Brumwell asked him to rebuild the house at Pill Creek, which he did with the help of his then business partner, Norman Foster. The work was paid for by the sale of a Mondrian painting that was in the Brumwell collection, and it was overseen by the architect, Henry Gilbert. Gilbert (or 'Gilly') went on to be a life long friend of John Wells, and to run the Wills Lane Gallery in St Ives for many years. The house, a beautiful two bedroomed design made largely of breezeblocks, is called Creek Vean (pictured above x3). It was owned by the Brumwell family until 2004 until Rene, Marcus Brumwell's wife, died.